PRESIDENT Mugabe yesterday appointed Cdes Emmerson Mnangagwa and Phelekezela Mphoko as Vice Presidents of the Republic of Zimbabwe and reshuffled his Cabinet to replace former Vice President Joice Mujuru, seven ministers and a deputy who were fired for expending their time on graft, factional politics within the governing Zanu-PF and undermining, seeking to depose and/or assassinate the President. The two Vice Presidents and the newly-appointed nine Government ministers, and two deputies will be sworn in today at a ceremony to be held at State House at 10am. Cdes Mnangagwa and Mphoko were appointed Zanu-PF second secretaries at an extraordinary session of the Zanu-PF Central Committee on Wednesday. President Mugabe said over and above other responsibilities, VP Mnangagwa would continue with his portfolio as Minister of Justice, Legal and Parliamentary Affairs, while VP Mphoko would be responsible for the promotion of National Healing, Peace and Reconciliation. This portfolio was held by the late Vice President and national hero Cde John Landa Nkomo. In terms of Section 104 of the Constitution of Zimbabwe, Amendment Number 20 of 2013, that deals with the appointment of ministers and deputy ministers, Dr Sibanda said President Mugabe also appointed the following eight Ministers and two Deputies. 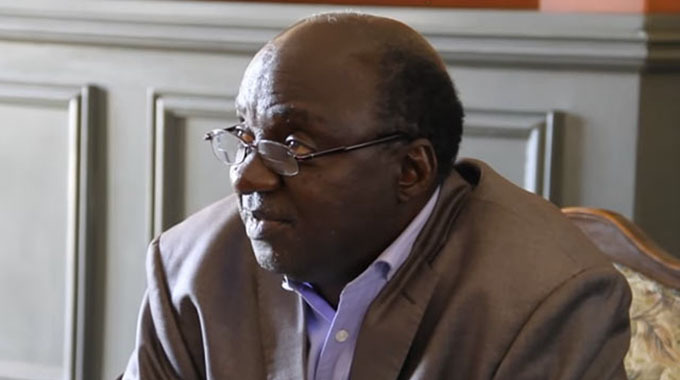 The newly-appointed Zanu-PF national spokesperson and former Senior Minister of State in the Office of the President and Cabinet, Ambassador Simon Khaya Moyo, was appointed to the new portfolio of Minister of Economic Planning. The Ministry of Public Service, Labour and Social Services is now under Cde Prisca Mupfumira, who replaced Cde Nicholas Goche who was sacked for his involvement in the plot to assassinate the President and replace him with ousted VP Mujuru. Cde Oppah Muchinguri; who was Minister of Women Affairs, Gender and Community Development; has been assigned to the Ministry of Higher and Tertiary Education, Science and Technology Development, taking over from Dr Olivia Muchena who was fired for performance below the expected standard. She was also part of the Mujuru cabal. An appointment for the Ministry of Women Affairs, Gender and Community Development will be made later. 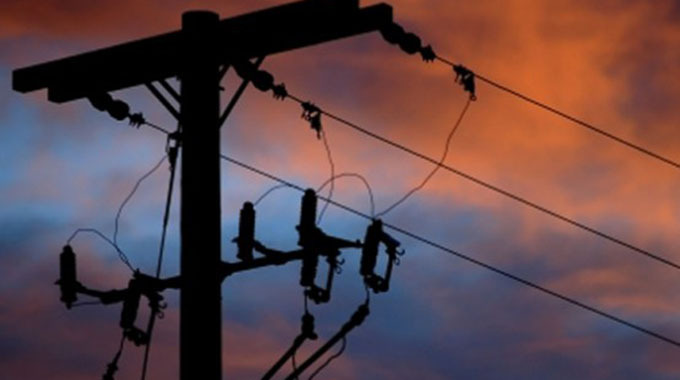 Former Deputy Minister of Finance and Economic Development, Cde Samuel Udenge was appointed Minister of Energy and Power Development, replacing Cde Dzikamai Mavhaire, who is also linked to the sacked VP Mujuru’s cabal. Cde Udenge will be deputised by Cde Tsitsi Muzenda. Manicaland Minister of State Cde Christopher Mushohwe was moved to the Ministry of Youth Development, Indigenisation and Economic Empowerment, replacing Cde Francis Nhema, who is also linked to the former VP Mujuru’s faction. Cde Mandi Chimene — Zimbabwe National Liberation War Veterans Association spokesperson — takes over from Cde Mushohwe as the Minister of State for Manicaland Province, while former Deputy Minister of Local Government, Public Works and National Housing Cde Joel Biggie Matiza is now the new Minister of State for Mashonaland East Province, replacing the ousted Cde Simbaneuta Mudarikwa. Former Deputy Minister of Information, Media and Broadcasting Services Cde Supa Mandiwanzira was promoted to head the Ministry of Information Communication Technology and Courier Services that was under the fired Cde Webster Shamu. Cde Monica Mutsvangwa, replaces Cde Mandiwanzira as Deputy Minister of Information, Media and Broadcasting Services. 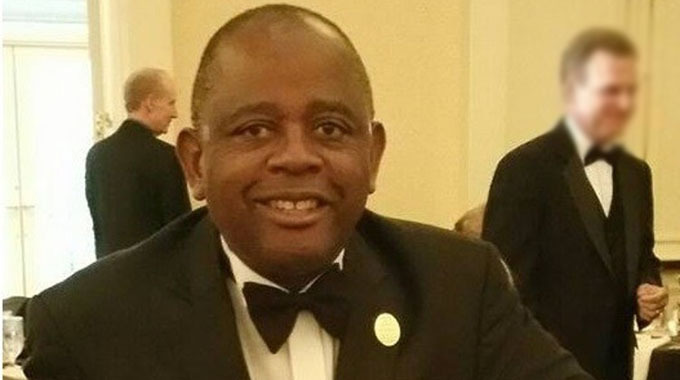 Deputy Minister of Foreign Affairs Ambassador Christopher Mutsvangwa was promoted to lead the newly-created Ministry of Welfare Services for the War Veterans, War Collaborators, Former Political Detainees and Restrictees. 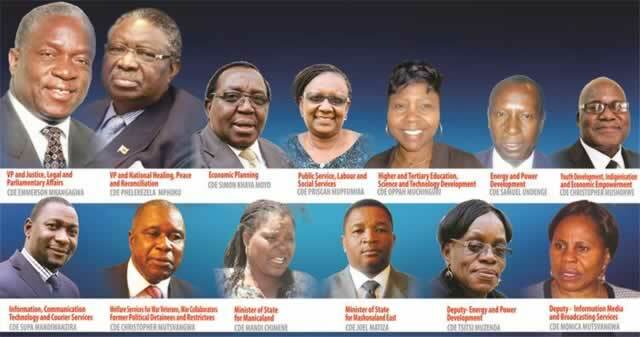 They are; Cdes Mupfumira, Udenge, Mushohwe, Mandiwanzira, Chimene, Matiza, Muzenda, and Christopher and Monica Mutsvangwa. The President fired the following ministers and a deputy for their conduct and performance which failed to meet expected standards. VP Mujuru, Minister of Presidential Affairs Cde Dydimus Mutasa, Cdes Shamu, Nhema, Muchena, Mavhaire, Goche, Mudarikwa and Deputy Minister of Energy and Power Development Cde Munacho Mutezo.